In a small bowl, mix the yogurt, a large pinch of salt, and the mint. Set aside. Crumble white bread crumbs over ground beef and parsley in large bowl. Place a large frying pan over medium low heat. Add the olive oil and sweat the onions and garlic until translucent. Add 3/4 tsp salt and the coriander and cumin, and saute a minute more. Cool a minute and then add to the meat-bread crumb mixture. Add the beaten egg and mix with hands lightly just to combine. 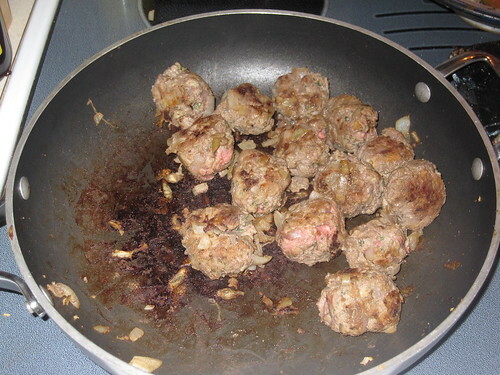 Form a test meatball and fry – taste for seasoning and add additional salt if necessary. Form into meatballs. Fry in batches in the pan on all sides until cooked through. Drain on paper towels if necessary. 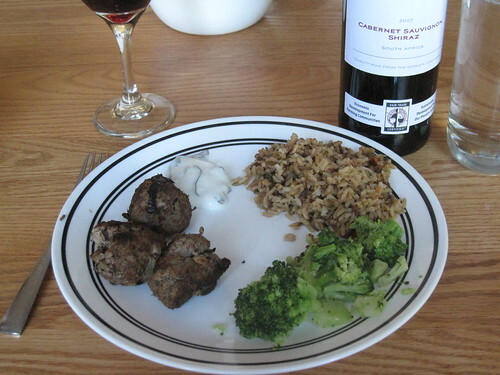 Serve the meatballs with the yogurt-mint sauce. Delicious as sandwiches with pita or naan bread. A few things popped out at me immediately that indicated this recipe would be a lot of work. First, the ground coriander – dried coriander in the store is not the same thing at all. Ground coriander needs to be freshly ground or it loses most of its flavor. Second, the julienned mint leaves – meaning you’re slicing the mint leaves into thin strips – will be significant work as well, and likely the most expensive aspect of the recipe if you don’t have a source of fresh mint. In order to try out the recipe as is, though, I did both of these. I also went through the cupboard and the freezer to see what we had on hand. The only ingredients that we didn’t already have in spice jars were the mint leaves ($2), the yogurt ($0.99), the onion ($0.30), and the ground beef ($2.49 for a pound of lean meat), for a total cost of $5.78. We did, of course, use lots of spices and other materials we had on hand. Here are the ingredients as I used them. I made one major change. Instead of mincing the onions, I coarsely chopped them, because I love the caramelized flavor of onions and felt it would add to the meatballs. Once the work of prepping the ingredients is done, the recipe itself is pretty easy. 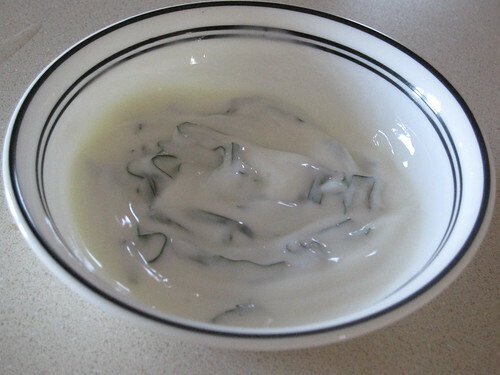 First, I made the yogurt-mint sauce by putting a pinch of salt, a cup of yogurt, and the mint leaves in a bowl and mixing them. 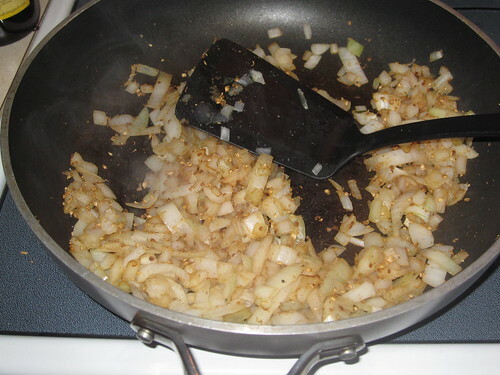 I then tossed the onions and garlic into a frying pan along with the olive oil and cooked them over medium heat until they were nicely caramelized – taking on a light brown color roughly the same as caramel. I then added a pinch of salt, the coriander, and the cumin, and cooked it for a minute more. When that was finished, I let it cool for a bit. 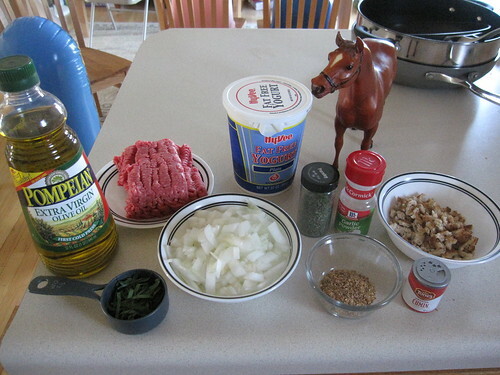 While doing that, I added the bread crumbs and the beaten egg to the pound of ground beef and mixed them together with my hands, then I added the onion mixture to the meat and mixed that in. The result was a large ball, ready to be shaped into smaller meatballs. Making meatballs is easy. Just pinch off a bit of the meat – whatever size you like – and roll that bit around in between your hands until it forms a round ball. If you’re not sure what size to make, just divide the ball into equal halves, divide each of those halves into equal halves (four bits), divide each of those halves into equal halves (eight bits), then divide each of those halves into equal halves (sixteen bits). Each of those sixteen bits will make a nice meatball. So, I rolled up the balls and tossed them into the frying pan. 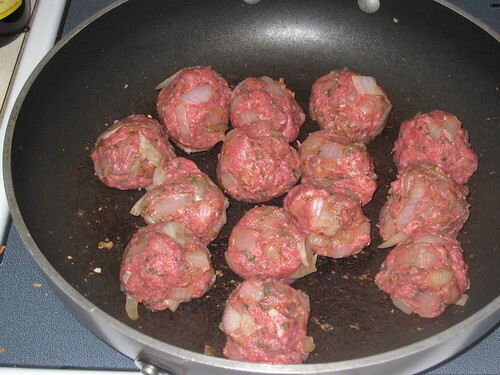 Obviously, if you chose to mince the onion, you wouldn’t see the large pieces of onion in the meatballs. Did we like it? This meal was a big hit. The kids were not big fans of the mint sauce, but the meatballs were completely consumed with gusto – no leftovers at all. Both my wife and I liked everything – I wound up drowning the meatballs in the sauce after trying them together. Our total cost for the main course and the mint sauce (ignoring fractional items we had on hand): $5.78. Our cost per meal: $1.45. Not bad. But we can do better – and we can certainly make it less involved. First of all, I’d skip the coriander and use more cumin as a substitute. If you don’t have a grinder, smashing the coriander seeds will take forever and it doesn’t contribute substantially to the meal, especially when you can easily substitute a bit of cumin for nearly the same effect. Second, if I was pinched for time, I’d substitute dried mint for the fresh mint leaves. I’d just add dried mint – probably two tablespoons full – to the yogurt to taste and skip the julienning of the mint leaves. 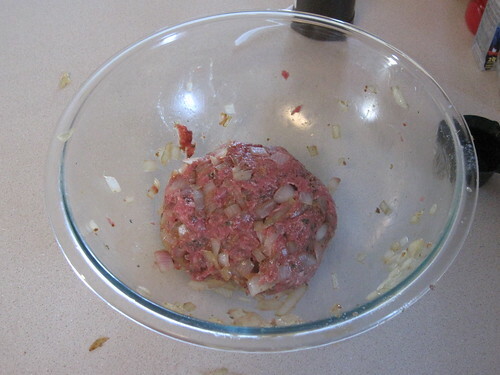 Third, I’d substitute garlic powder for the minced garlic cloves. Although you miss the caramelization of the cloves, you also save the work of peeling the cloves, cooking the cloves, and smashing the cloves. Fourth – and I did this in my own version above – I’d skip the fresh parsley and use dried. I used 1/4 cup dried parsley and it was perfect. Place a large frying pan over medium low heat. Add the olive oil and gently cook the onions until caramelized. Add 3/4 tsp salt and the cumin, and saute a minute more. Cool a minute and then add to the meat-bread crumb mixture. Add the beaten egg and mix with hands lightly just to combine. Form into meatballs. Fry in batches in the pan on all sides until cooked through. Drain on paper towels if necessary. Serve the meatballs with the yogurt-mint sauce.